that knows the subject better than you? When you sense that members of your audience have greater subject-matter expertise than you, it can quickly drain your confidence and cause you to second-guess everything you’re about to say. Fortunately, there is a way to navigate this predicament. Even if you’re not the most knowledgeable person to speak on that topic, you can still deliver a powerful presentation with the right approach. 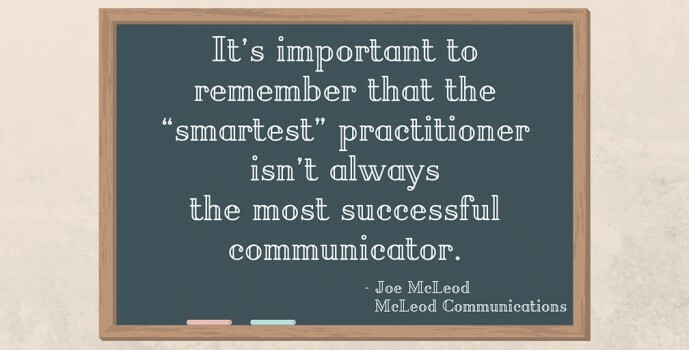 It’s important to remember that the “smartest” practitioner isn’t always the most successful communicator. We’ve all heard a presenter or teacher who clearly knew the material but never connected to the audience. Maybe they were dull, long-winded, arrogant or automatically assumed everyone in the room understood the basic theorems of algebraic topology, so there was no need to clarify. When speaking to experts, it’s best to practice first AID (Acknowledge, Involve and Deliver). 1. Acknowledge your audience’s familiarity with the subject. What better way to win over a crowd than by recognizing the fact that they are intelligent professionals. Don’t put yourself down (e.g., I don’t know this topic as well as you). Instead, lift them up. Not only will this give the audience a sense of value, it also puts them on the hook to participate and share their wisdom. 2. Involve them in your presentation. In most cases, it’s acceptable to act as a facilitator instead of a lecturer. Engagement makes the experience more enjoyable and, in many cases, more meaningful for everyone in the room. It’s like opting to conduct the orchestra instead of trying to play all the instruments yourself with members of the orchestra as your audience. 3. Deliver with confidence. Studies have shown that confidence projected verbally and nonverbally gives you instant credibility. However, credibility can evaporate quickly if you pretend to know more than you actually do. If you try too hard to prove yourself, it will likely backfire. The audience is more inclined to be impressed by the fact that you aren’t trying to impress them. Remember, your confidence is not based on your superior knowledge of the subject but rather in your ability to lead, facilitate and ultimately produce a worthwhile experience for the group. This post originally appeared on the McLeod Communications blog. Joe McLeod oversees the firm’s communication coaching and training programs.